What Youth Journalism International does, in a nutshell, is provide a free education for young people in any country who are interested in journalism, current events and getting to know their peers across the globe. With students in scores of countries, the New England-based nonprofit provides a powerful platform for young people to tell their stories — to hand them a megaphone to speak to the world. It is empowering. It is uplifting. And it is building bridges that span the world, crossing cultural, religious and national divides to create a far-flung family that includes students and alumni reaching all the way back to the organization’s roots in 1994. YJI students at ESPN in 2010: Katie Jordan, Kiernan Majerus-Collins, Laquandria Fenn, Becca Lazarus. Over the years, YJI has had more than 400 students, who have written stories from every continent. YJI is a big, welcoming family that encourages youngsters between 12 and 24 to develop friendships with one another and to acquire the skills that will help them flourish wherever they are and whatever they wind up doing. Our alumni include doctors, lawyers, social workers, journalists and many, many more leaders of a rising generation that promises a better world. The stories, pictures and videos that students produce under the guidance of professional editors and educators reach more than a million people of all ages, from every nation. Rich in diversity, YJI focuses on journalism, but also builds bridges across cultures and helps students grow into thoughtful world citizens. Working with editors one-on-one and in groups, online and in person, students learn about writing, press responsibility and ethics. Reporting from their hometowns, students tackle tough topics such as terrorism, teen suicide and school violence in addition to writing about music, movies, politics, sports and more. The key to a better world lies with global understanding and truthful, effective communication. YJI’s students, telling important stories from their own neighborhoods and nations, represent every major religion and many cultures. By bringing these dedicated and idealistic young people together and giving their voices a powerful platform, YJI paves the way toward a brighter future for all. We think of YJI as a sort of peace factory. Suffused with the youthful idealism constantly flooding in from newcomers who want their chance to be heard, YJI makes it possible for students to have their voices added to the global conversation and to be taken seriously.Every year, scores of them jump at the opportunity after finding us online. We don’t search them out. They come to us. 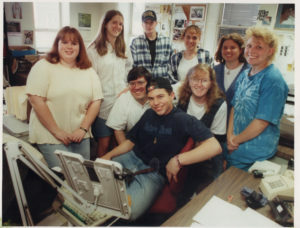 Youth Journalism International students in Bristol, Connecticut in 1995. 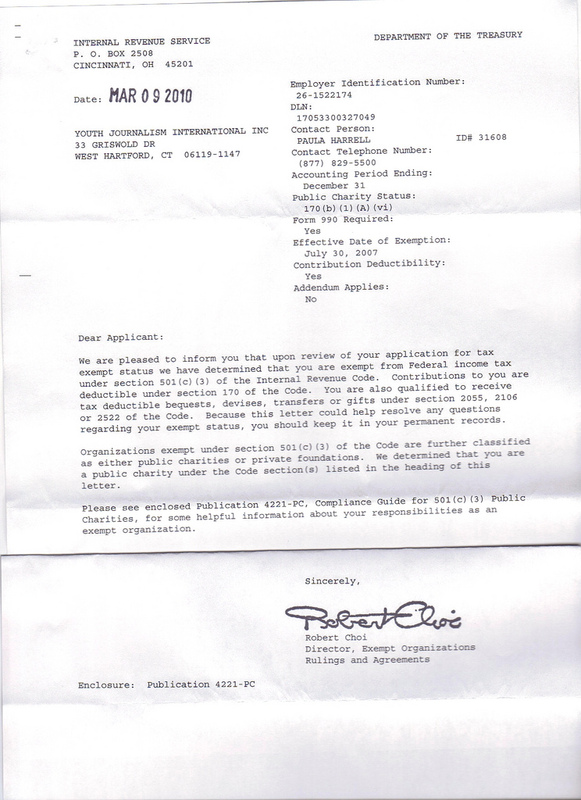 Youth Journalism International started off in 1994 as a small, informal group in Bristol, Connecticut whose work was printed in the local daily newspaper. By 1996, when students finished an award-winning series on teen suicide, its reporting was available online as well, one of the first teen-written newspapers online and the only one from that era that still exists. Starting in 2001 with a young woman from Singapore, Kaishi Lee, it began to attract participants from distant locales. Lee leaped at the chance to discover what makes America tick, and to talk, on the phone and through instant messaging, with students closer to our original base. Little did any of us know that largely because of her participation she would snag a full scholarship that allowed her to attend,and graduate from, Wesleyan University, just down the road from YJI’s headquarters at the time. It was just another indication of how this small organization was making the world smaller, too. Lee opened the floodgates. 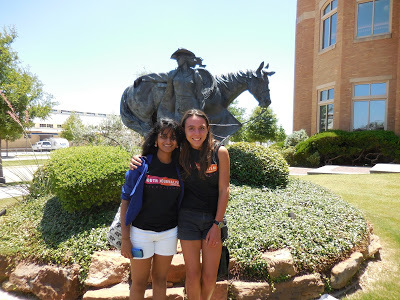 Since her day, hundreds of students from across the United States and all around the globe have participated fully. One of them, Edrees Kakar from Afghanistan, today serves on YJI’s board of directors. Others are Ambassadors, contest judges, advisors, donors and friends whose bonds with one another and YJI remain strong as the years go by. 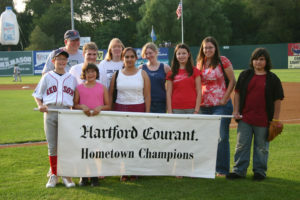 YJI named a Hometown Champion in 2006 by New Britain Rock Cats. When YJI’s founders, longtime journalists Jackie Majerus and Steve Collins, started teaching young people, they never imagined what it would become, that it would open doors not just across town but across seas. Now, with the help of generous donors who see its value, YJI has become one of the most respected journalism organizations anywhere. Its students’ work has appeared in a National Geographic textbook, on PBS Newshour Extra, on public radio and in a number of newspapers. Its annual contest, started in 2010, was the first to takes entries from students in every country and has sent trophies to students on five continents. It is constantly growing and, we trust, always improving. None of this would be possible without the aid of generous donors. The organization operates on a shoestring. It always has. We have been committed from the start to devote everything we have to our mission. It is our calling but it only succeeds if those share our vision are ready to lend a hand financially or whatever way they can. We are proud that in all our years, we have never charged a student to participate. That’s one reason we have students in poor Third World villages who have the drive, ambition and talent to take a step onto the world stage. This is one place where it doesn’t matter whether a student comes from great wealth or dire poverty. We embrace all of them. You can find out more about Youth Journalism International by reading a few stories that have been done about YJI over the years. Take a look at this one from Hartford magazine and this one from the Dow Jones Adviser Update and this from Boston Tutoring Services. There’s also a list of Frequently Asked Questions that might help shed more light on how YJI works. Want to find out even more? Scrounge around on this website. There are thousands of examples of students’ work right here! You can also find the work that students did between 1994 and 2011 at our old Tattoo Teen Newspaper website. Here’s a place to start with that. Our social media accounts have lots more as well. 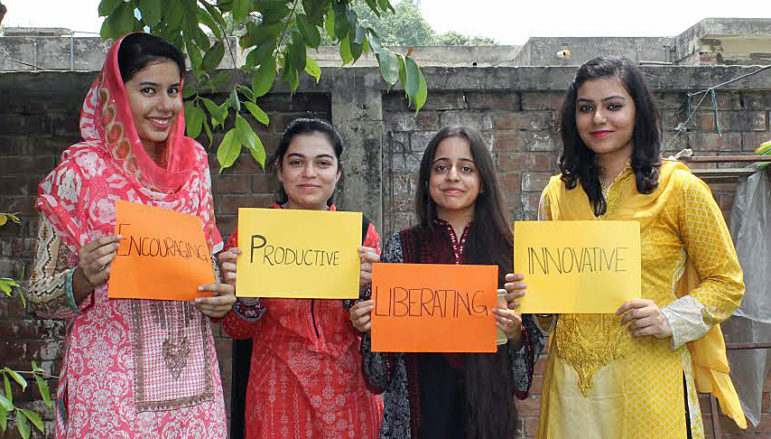 YJI students in Lahore, Pakistan: Amber Shakil, Irha Nadeem, Hafsa Ahmed, Arooj Khalid holding up signs they chose to describe YJI.